Since June when Tigrett made his pompous announcement about being Sai Baba’s ‘living will’, no one of any note in prominent Sai Baba circles – the Sai Trust etc. – has responded positively or even asked to hear his mind-boggled outpourings. No one has made an attempt on his life either, as he hinted could happen… as if he was of such importance to merit that. The international Sai organization has not taken the slightest bit of notice of his claims. The lifelong-misguided photographer Mr. Mistry seems to be his only public promoter. How could they afford to endorse in any way a person who believed Sai Baba to be a sexual abuser and said on the BBC documentary for all the world to see that it made no difference to him.. not even if Sai Baba went out and murdered someone! Tigrett blathers about some amazing drawings of “metaphysical machines” Sai Baba supposedly gave him. The very term is a self-contradiction (an oxymoron – which term one is tempted to apply to the walking self-contradiction Tigrett himself). Could it be a machine for fetching vibuti, amrit and laddu out of the akasa? Or hot Indian dinners (as Sai Baba reportedly did!). Probably these airey-fairey constructs would “turn earth into sky and sky into earth”, as Sai Baba boasted he could do (but never demonstrated). If Tigrett ever presents these incredible blueprints to the world, we may expect something equally laughable, seeing how Tigrett lives on in a closed fantasy world of imagined ‘spirituality’… what on earth did Sai Baba manage to do to his mind in addition to blowing it up! 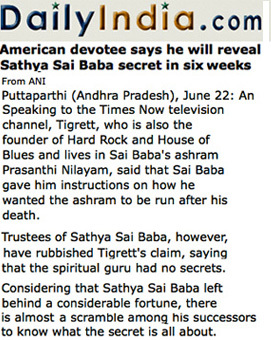 The former donor of the first major hospital at Puttaparthi, former multi-millionaire Hard Rock Cafe owner, Isaac Tigrett, has been living near Sai Baba for several years. The transcribed text of the shorter on-line video is above and gives his announcement. It sounds rather incredible (as usual with him) and he has spoken on TV saying that Sai Baba left instructions with him as to how the Ashram must be run, and also said he spoke to Srinivasan, SV Giri and Chakravarthi three weeks ago. He stated “I am living will now…but don’t know whether I will be after this interview” and said he “will reveal all to the worldwide Sai Baba devotees on Guru Purnima 6 weeks later”. Not surprisingly, Central Trust spokesmen have rubbished Tigrett’s claim… it would most likely reduce their power or even remove some of them! (See Daily India left below). Quite apart from his most injudicious statements on BBC TV’s ‘The Secret Swami’ condoning sexual abuse by Sathya Sai Baba and also murder, Isaac Tigrett has in recent years announced some fantastic things. Such as his belief in the power of the crystal skull he placed on top of a pyramidal building in Memphis and which was removed by authorities. His warning at this move was very dire, reminding of the mad prophets of doom that flourish here and there, especially in the USA and are always confounded by actual events! The history of the original crystal “Skull of Doom” (as preserved at the Smithsonian Institute) has been thoroughly discredited by researchers as a manufactured fabrication… and this must consequently apply to all the many copies that were made, like the one Tigrett claims he received from Sai Baba. Tigrett is a highly egocentric person who has started his own ashram-retreat in Coorg, promoting the mythology of the “Ascended Masters of the Seventh Ray” and similar fantasies. So perhaps a pinch of salt is in order regarding his latest attempt to take over the Sai Baba limelight. Devotees who want something to cling to will have to wait, wait, wait…. This entry was posted on June 23, 2011 at 8:53 am	and is filed under Gurus, Sathya Sai Baba. Tagged: Isaac Tigrett, Sai Central Trust. You can follow any responses to this entry through the RSS 2.0 feed. You can skip to the end and leave a response. Pinging is currently not allowed.